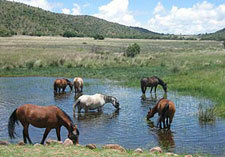 Cruiser Safaris Other Activities information: Horseback Safari and Bushmen Painting Site. This Horseback Safari, in the malaria-free Waterberg Mountains of South Africa, offers horse riding trails amongst African wildlife in a scenically diverse landscape of open savannah plains, river valleys and rocky escarpments with panoramic views. The safaris aim to please riders with a combination of exhilarating riding at different paces that can also cater to beginners and novice riders on different rides; responsive, happy and healthy horses; beautiful wilderness scenery and informative guiding. 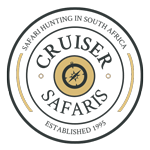 Traversing rights on adjacent private game reserves allow guests to explore more than 3000 hectares of bushveld; tracking and spotting game, observing the smaller creatures and enjoying the abundance of bird-life offered by the different habitats. On horseback, riders approach wildlife in a non-threatening manner and enjoy relaxed sightings of kudu, reedbuck, klipspringer, bushbuck, duiker, warthog, jackal, baboon, zebra, eland, impala, giraffe, waterbuck, red hartebeest and blue wildebeest. Deep-seated saddles are used for the comfort of both horse and rider, water bottles are provided on each saddle and saddlebags on request. First aid kits are carried on all rides. Guests are required to wear a riding helmet, which can be provided for you and must sign a standard indemnity form on arrival, prior to being allowed to ride or to walk on the reserve. If you are interested in this activity we ask that you please make note of your interest on the Preferences Questionnaire as it is necessary to make arrangements in advance. There is no charge for canceling later if you change your mind or time does not allow for this day trip. The indigenous people of Southern Africa are the Bushmen, or San. Their ancient rock paintings and carvings are found in caves and on rock shelters. Bushman paintings do not show snapshots of desirable food or daily activities but rather it shows what a person has seen while he was in a trance and visiting their spiritual world. Primarily the Bushman used ochre to paint with but also used iron oxides, white clay, crushed ostrich shells and in the last hundred years coal. During this guided tour to the bushmen paintings (or San Rock Art) you will be informed about the men who went into the trances and painted the paintings, why the paintings are painted in the different ways, how they danced for rain and much more. 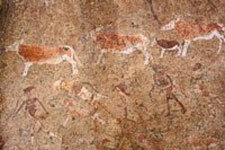 The Bushmen Painting Site tour takes about 1½ hours. The participants are required to walk to and from the site, a distance of around 450meters or 0.3miles either way. Groups of 4 people are taken by a qualified armed guide on an interpretive walk to the site for an interpretation of the paintings lasting about 50minutes, followed by a walk back to the vehicle. Additional persons can attend the activity but then the hosting lodge needs to supply an additional qualified armed guide. Cost: R627 (incl. VAT) for a group of up to 4 people.